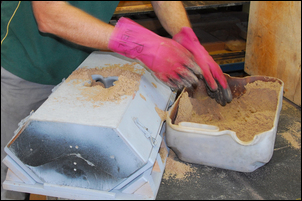 Last week in Metal Casting, Part 1 we saw how patterns and sand moulds are made for metal casting. Those patterns (and moulds) varied from being very simple to much more complex, the latter including cores, risers and runners. 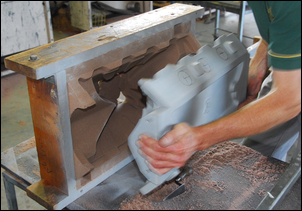 This week we’re going to watch a sand mould being prepared from a pattern, the work being done to produce an alloy aftermarket V8 intake manifold. To be able to follow the process, we suggest that you first read Part 1 of this series – otherwise, it’ll be really easy to get lost. 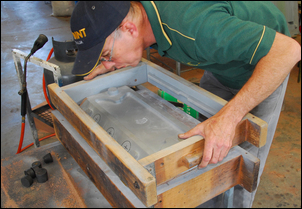 The moulding was being carried out at the Matilda Foundry in Maryborough, Queensland. 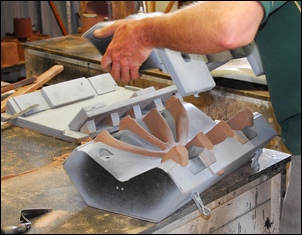 The Matilda Foundry specialises in small production runs in non-ferrous materials, including aluminium and bronze. We watched owner Neil Anderson at work. Neil has more than 30 years experience in casting. The final result is an amazing three-dimensional jigsaw puzzle! The first step was to retrieve the pattern from storage. Patterns are made by dedicated tradespeople called patternmakers. 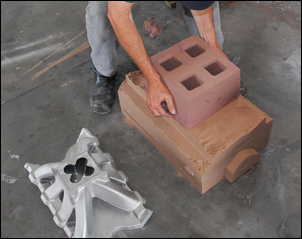 The pattern is critical to the success of the casting, not only in that it needs to create the correctly-shaped final product but also that it need to be able to be withdrawn from the sand mould, be durable, and so on. Some patterns that Neil has seen have been completely unworkable. 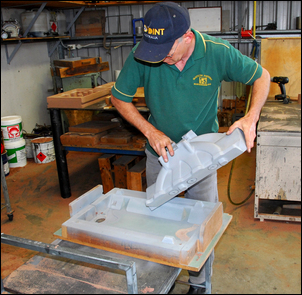 The pattern was first placed on the joint board; this plane will become the parting line of the mould. 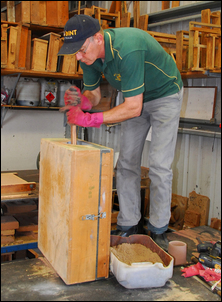 A removable wooden moulding box surrounds the upper part of the pattern. 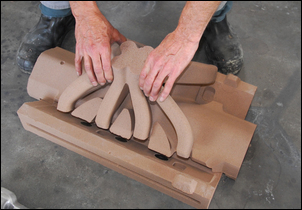 The part of the pattern that can be seen replicates the top surface of the intake manifold. The surface of the pattern was lightly dusted with talcum powder. 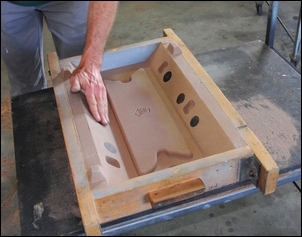 This allows the pattern to be more easily withdrawn from the sand mould. 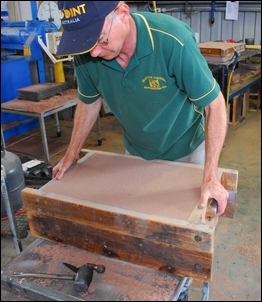 Next Neil filled a container with the special moulding sand. 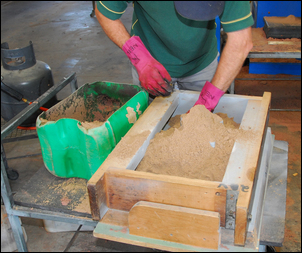 The machine adds the chemical binders to the sand as it is being dispensed. 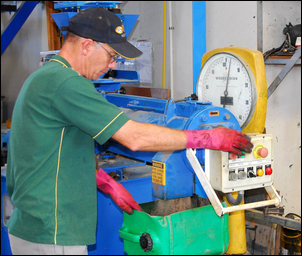 Scales are used so that the correct mass of sand for each mould is dispensed. 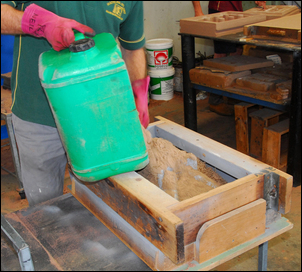 The sand was then poured into the moulding box. At this stage it flows just like normal, fine-grained sand – however it is hardening all the time. 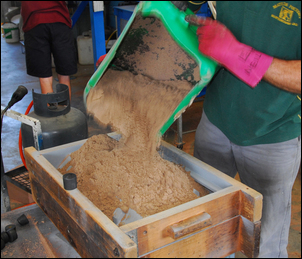 Neil suggested that on a hot day, he has to work fast to get the sand properly packed in the mould. Even on this cool day, he still worked fast! Using gloved fingers, he carefully packed the sand around the pattern, pushing it into openings and tamping it into place. Sand filled the moulding box almost to the top surface. The assembly was then placed to one side for the sand to go hard. The next step was to produce the cores. This is the core box for the undercentre of the mould. It will produce the shaped sand core that prevents metal flowing into the space under the runners. ...and then the corebox is closed and sand is packed into the closed volume. 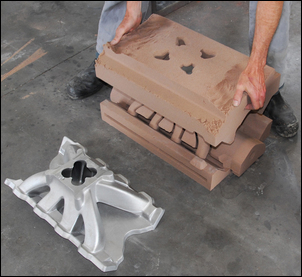 The sand core for the intake manifold runners is then produced. ....like this. Note the circles marked on the pattern – we’ll come back to their function in a moment. ...this side of the pattern is boxed. 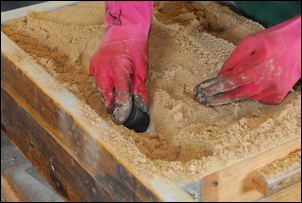 After the sand has set, the runner core box can be parted, revealing the runner sand core. The runner core pattern comes apart (the arrowed parts removed) to allow the core to be withdrawn complete and undamaged. The complete sand core for the runners. 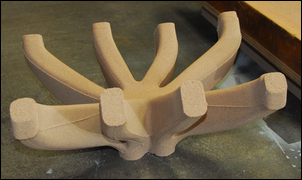 It’s now much clearer how this shaped sand core represents the ‘induction air passages’ portion of the intake manifold. The other core that we saw being made was the undercentre core. This has also now hardened and can be withdrawn from its core box. 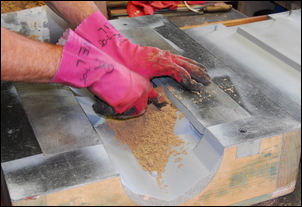 The sand core for the runners is then cleaned up, a small trowel being used to remove the joint fin (the line left by the parting face of the core box) from the core. 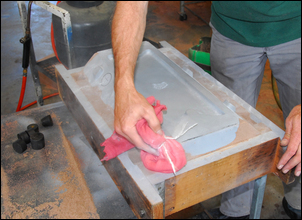 The bottom of the mould can now also be removed, the sand having hardened. 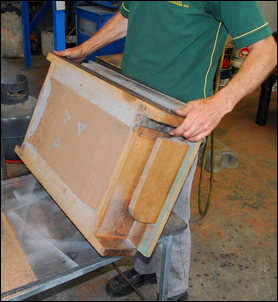 The bottom surface of the mould, complete with brass chills, can now be seen in its finished form. It needs only to be removing from its moulding box. 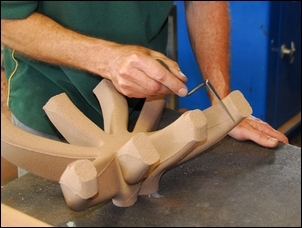 The pattern is then removed from the upper portion of the mould. 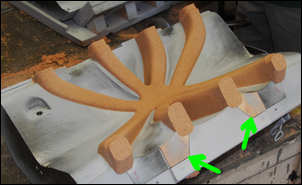 In this and the above pic you can now see the upper and lower internal surfaces of the mould. 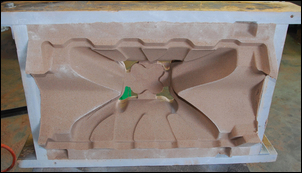 The underside of the top section of the mould shows four openings. These are for two runners and two risers – that is, where the molten aluminium will be poured in and where it will rise up far enough to nearly overflow. The mould and cores can now be assembled. 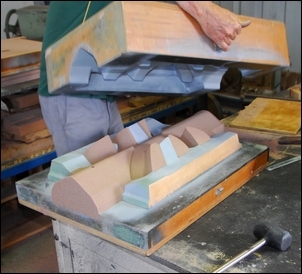 The underside core is firstly placed on top of the lower section of the mould. 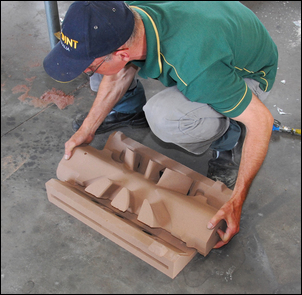 I must admit to getting lost at this point so Neil placed the finished casting (a Funnelweb 2V 351 Ford V8 inlet manifold by Parker Racing) next to the incomplete mould. Looking at this pic, you can see how the underside core (arrowed) represents the lower spaces of the manifold not filled with alloy. Next the runner core can be placed into position. Note how this core fits into recesses in the lower mould, so allowing proper registration. 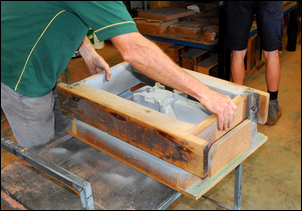 The mould is then closed by the placement of the upper half of the mould. 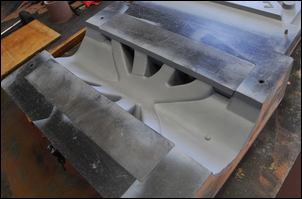 Finally, the mould for the runners and risers is rested on top. It is through two of these holes that next week we’ll see the liquid metal being poured. 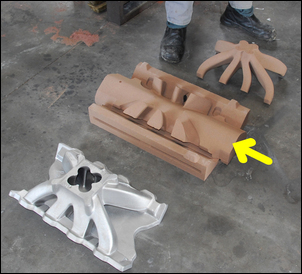 As you can see, the complexity of moulds and cores can move very quickly from something as simple as the ‘cotton reel’ shaped casting we saw the pattern and mould for last week, to a sand mould consisting of four separate, interlocking parts. 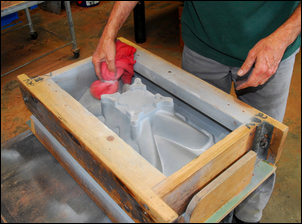 The complexity of a cylinder head mould can only be imagined! 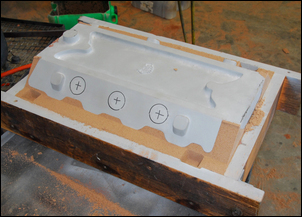 Next week, in the last part in this series, we’ll watch the intake manifold being poured and then the sand mould being broken open to reveal the results.